A manatee cow and her calf bobbed up alongside us to take a breath of fresh Florida air and investigate our kayak flotilla. The calf took a particular fancy to my son, following his green kayak as it floated with the current down the river. 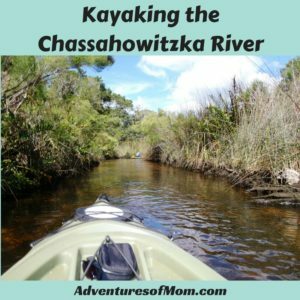 It was Sunday and we were kayaking Florida’s Chassahowitzka River in Citrus County. 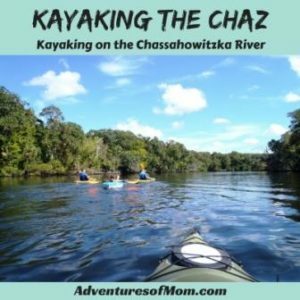 Better known as ‘The Chaz’ by locals and bad-spellers like me, Chassahowitzka means ‘ place of hanging pumpkins’, named by the native Indians for the local squash that grew on vines over the trees in the area. According to the Southwest Florida Water Management District (SWFWMD) this 5.6 mile river was designated as an Outstanding Florida Water, OFW- or a waterway worthy of special protection, a status given to 41 of Florida’s rivers & lakes to preserve their water quality. (Read more about OFW on the Outstanding Florida Water website). 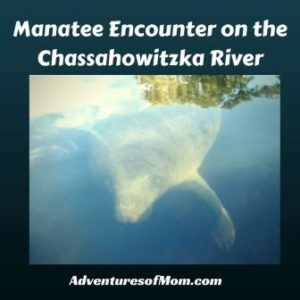 The Chassahowitzka stretches from a group of a dozen springs known as the Seven Sisters Springs to the Gulf of Mexico. The river winds through the 30,000 acre Chassahowitzka National Wildlife Refuge, but it’s the side creeks with names like Little Gator Creek, Baird Creek, Johnson Creek and Potter Creek, that make for the best kayak explorations. At the Chassahowitzka River Campground and boat ramp ($5 parking, $10 with trailer), they hand you a map of the river, and on it are the local springs. Though not to scale, this map offers a great guide for family explorations. 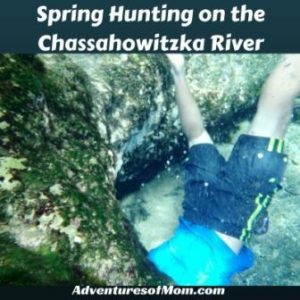 A kayaking group we met were checking off the springs on their map as they found them, like treasure hunters- only spring hunters, their reward? Turquoise blue waters and limestone caves. Our own map got drenched- yes, this sloppy paddler was in charge of it, so a plastic protector or snap shot of the map may be useful for reference later in the day. As reported by the Citrus County Chronicle: Back in 2012, a man snorkeling near the campground boat ramp area bumped into a 7 foot alligator who then proceeded to try and eat him. Luckily the snorkeler managed to escape. The water around the boat ramp is black- not a tannin stained brown, but a pitch black as night. And people clean their fish there, throwing the carcasses back into the water. It smells like fish. Take a stab in the dark what critters may lie lurking beneath the water there. Even though we did not see any alligators in the vicinity during our visit, there is no way I would choose to snorkel there. It is definitely not a swimming hole. Save your swimming for the springs. You can do what most people do and take a right when you put in and head the short distance to the Seven Sisters Springs- a series of springs and cave systems. There’s a sign above the main cave diving spring, warning people to be cautious. People have died in these caves. Whether they becoming disorientated or ran out of air while free-diving (without tanks), I am not sure. My kids and I perched on the rocks around one of the caves, watching as the brave-hearted dived through. I asked one of the divers, a local, if it was confusing in the cave, and he said, no, as long as you go straight, but if you deviate from the tunnel, which you can, he said he could understand how other swimmers might get confused. The Seven Sisters Springs were crowded. It was the ‘ weekend hangout’, where kids swam, people set up folding chairs in the shallows and drank and smoked. This was the busiest spot on the Chaz. Leaving party-central, we took our kayaks down river. The water was shallow- very shallow, so it’s not good for boats with depth. Years ago we canoed the Chaz and stopped right along the river to let the kids out for a swim. It’s that shallow. Farther downriver we were approached by a manatee cow and her calf. Florida law is strict regarding manatees- you can’t touch them and you are not allowed to come between a cow and her calf at any time. The older manatee had deep gashes across it’s back- a sobering sign that she had been hit by boat propellers- numerous times. I had never seen a manatee this close, and the wounds, though healed, were disturbing, especially as a fishing boat raced down the center of the river at a high speed while we were out there. There was no possible way the mother and her baby could have gotten to safety had they been in the center of the river. The calf decided it liked our son and followed him and his kayak. I told him later that maybe it thought the olive- green kayak was another manatee. The gentle giants soon moved on, and we headed down Baird Creek. Kayaking down the narrower channels of Baird Creek. Baird Creek winds through saw grass marshes and limestone edged embankments. It’s long, narrow and twisty. At times we could only fit one kayak at a time due to the width. The creek narrows to a point where the water rushes against you with the strongest current on the river that we witnessed, and then it opens up to a series of small ponds, one of them the quiet turquoise waters of Blue Springs and farther up Crab Creek, where the kids actually did find blue crabs! Though my husband admits to having camped here with his friends in his youth, you cannot access these places by foot. Serene and distant from civilizations, these are best explored by canoe or kayak. We had to fight the current heading back to the campground. Our son actually towed our daughter for part of the ways, though I suspect that was more due to her having a ‘kayak protest. '(She didn’t protest while swimming in any of the springs though!). Thinking of exploring the Chaz? The Chassahowitzka River campground offers camp sites & boat rentals year round. Don’t forget to get your map before you hit the river!